Michael Ballam’s Utah Festival occasionally presents works not normally seen in Utah. 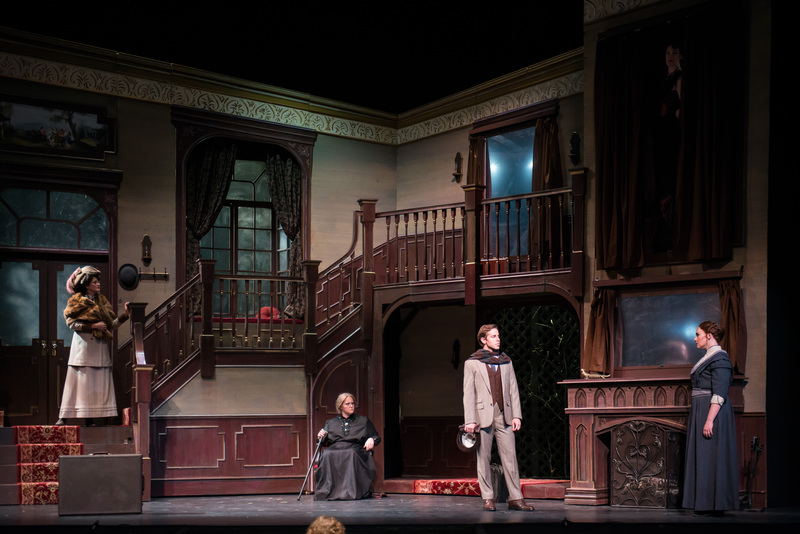 In the past the festival has staged Giacomo Puccini’s Manon Lescaut and Modest Mussorgsky’s Boris Godunov, both of which Utah Opera has yet to mount. This year, it’s Samuel Barber’s 1958 Pulitzer Prize winning opera Vanessa, another first for the festival. From left: Beverly O'Regan Thiele (Vanessa), Amanda Tarver (Baroness), Andrew Bidlack (Anatol), Alice-Anne M. Light (Erika). Photo Credit: Waldron Creative. The opera, with an original libretto by Barber’s partner Gian Carlo Menotti, offers a painful glimpse into the lives of Vanessa and her niece Erika as they are wooed and used by Anatol, the son of Vanessa’s old lover. Barber captures the atmosphere wonderfully with his music. While it’s overwhelmingly romantic, it’s tinged with biting dissonances that underscore the growing tension between the two women, between Erika and Anatol and between the women and the old Baroness, Vanessa’s mother. There is a brooding darkness that flows through the story that is at times quite unnerving. It’s a remarkable and bold work that has unfortunately never found a permanent place in the repertoire of American opera houses. The cast assembled for this production is stellar. Leading off is soprano Beverly O’Regan Thiele in the title role. Her portrayal is emotionally charged and finely nuanced. Vanessa is a tragic figure as she denies reality and fights so desperately to stay in the past. Thiele captured that brilliantly. Thiele was also brilliant vocally, hitting the high notes of her demanding role with ease while still infusing her singing with a keen expressiveness. It was quite an impassioned and virtuosic presentation. No less stunning was the mezzo-soprano Alice-Anne M. Light as Erika. She, too, captured the complexity of her role with her fabulous acting that brought conviction to her portrayal. And her singing was equally notable. Her role is no less challenging that that of Vanessa’s and Light made short work of the vocal demands. Her singing was crystal pure and gorgeously lyrical. Alice-Anne M. Light (Erika) and Andrew Bidlack (Anatol). Photo Credit: Waldron Creative. Tenor Andrew Bidlack as Anatol held his own remarkably well. With two such powerful females voices it would be easy to get lost, but Bidlack commanded the stage when he was present and blended wonderfully in ensembles with Thiele and Light. He possesses a forceful high tenor that is perfect for this role, since Anatol is required to sing in the high register frequently. In the role of the Doctor was the bass Richard Zuch, who sang with finely crafted expressiveness. His voice is resonant and beautifully rounded and was a wonderful contrast to the three high voices. And he showed himself an exceptional actor as well, bringing much need comic relief in his well played drunk scene in the second act. As the stern Baroness who disapproves of Vanessa’s and Erika’s decisions is the mezzo-soprano Amanda Tarver. She gave a strong performance that captured perfectly the unforgiving, almost hard hearted nature of her character. Baritone Kevin Nakatani and tenor Jon Jurgens sing the small roles of the butler and the pastor, respectively. The stage direction, by Daniel Helfgot, was spot on; the action moved forward at a good pace. The orchestra played the difficult score marvelously under conductor Barbara Day Turner. Her tempos were well chosen and she never allowed the singers to be overpowered by the orchestra, even in the loudest passages. This is a production that is well worth the drive to Logan to see. No one will be disappointed. Vanessa will also be performed on July 18 and 24 at 7:30 p.m. and on Aug. 2 at 1 p.m. 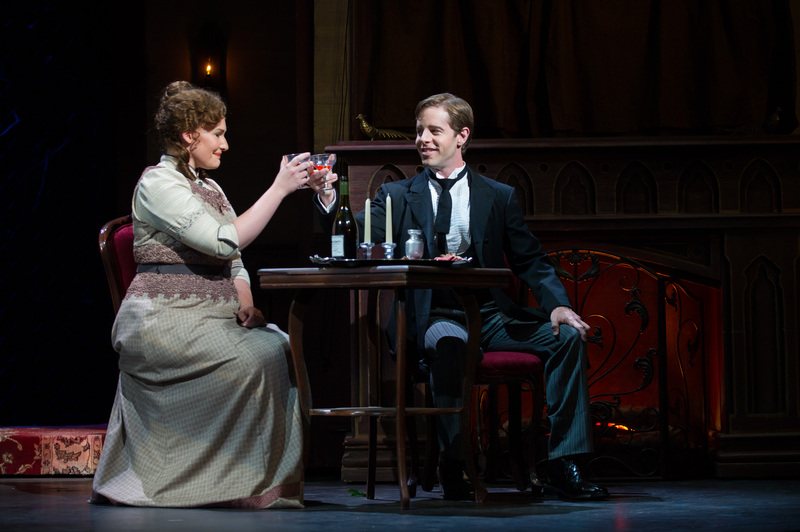 The opera is in repertory with Oklahoma!, The Student Prince and Les Misérables.